So this is the look I've chosen; these midi skirts are really in at the moment and will be a huge staple piece in the spring so I suggest you get your hands on one quickly! This lovely green one is from Topshop, here. I paired it with a cute cropped fluffy knit jumper from Glamorous, here, as fluffy knits are so in at the moment and in the spring it isn't quite yet warm enough to wear something sleeveless so I thought this was a nice alternative - saves having to wear a massive jacket too! I decided to dress down this look with some plain white converse which are avaliable here and a cute black back pack from Monki here. You can then add any accessories that you'd like to this look. You could even dress it up with a cute cropped cami, a pair of heels and a clutch for an evening spring time look! I hope you liked this spring look! It makes me wish it were spring already; I can't wait to go bare legged and not have to wear a hug winter jacket! I think this look is super cute and has just the right amount of girly. It's great when you buy one staple piece, like this skirt, you can just dress it up and dress it down however you like and it will still look amazing! 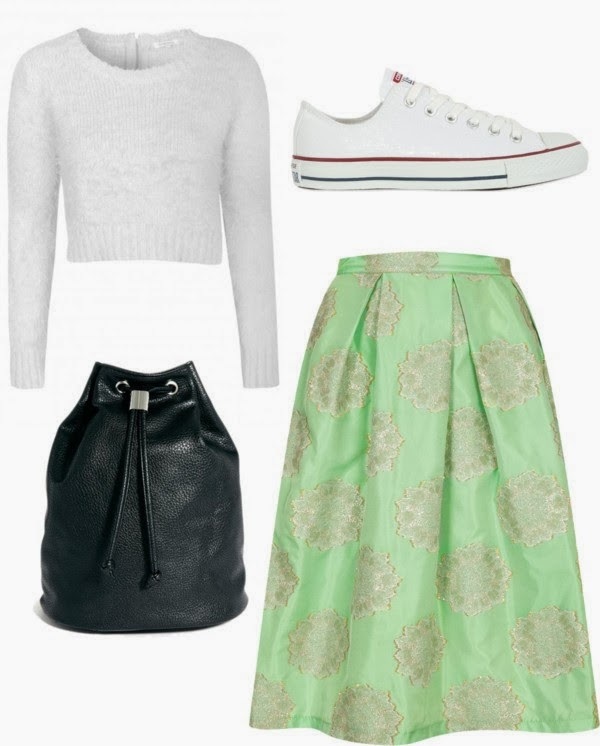 I'd love to know what you think of this look and how you would style this skirt, so leave some comments below! Come and say hey and if you do, let me know that you came over from Megan's lovely blog!